Today's post is a little more personal than I usually take this site. 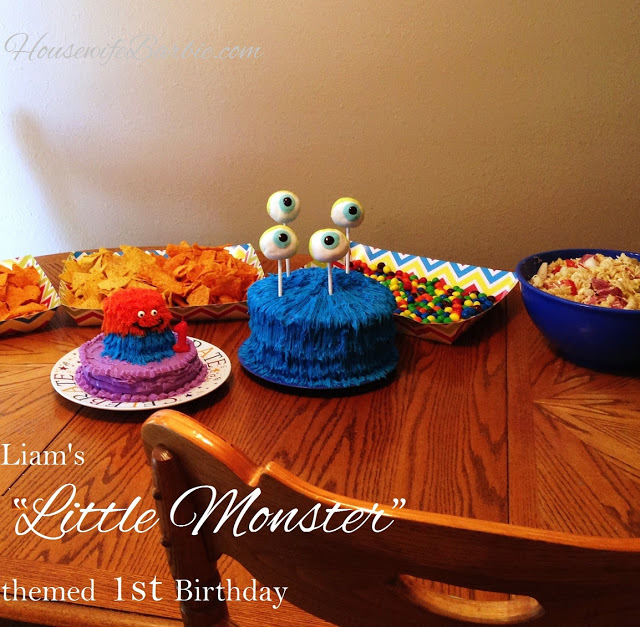 It's a birthday party my oldest daughter planned for her son's first birthday; a Little Monster theme. She did a fabulous job and everyone had the greatest time - and the cakes were so cute and delicious! 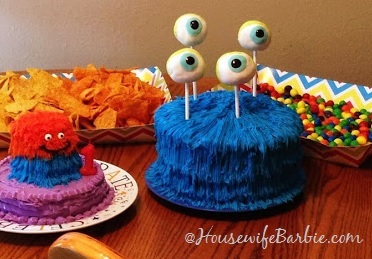 She isn't a cake maker or decorator but these Little Monster cakes were so easy and fun to make - anyone can do it. She was decorating these at midnight the night before the party - so even sleepy, and using store bought frosting in a can works perfectly for these cute little cakes. She didn't use any directions, she just looked at a couple pictures and 'winged' it. I helped her make the eyeballs out of fondant and rice krispy bars while she worked on the monster 'hair'. There are some items you need - she ordered everything off the internet from various sites but I believe you could get most of it from Michael's or Walmart too. The cakes were baked in various sized pans. The large monster is simply a couple 8" rounds stacked with icing between. The small monster cake for the birthday boy was one round with two littles. You could also freeze and stack 2 more rounds and after they are frozen, cut out the shape of the tiny little monster from, rounding the top off. After baking, cool completely. Stack and freeze the cakes for easy decorating later - or if you are short on time, refrigerate to cool. Using the icing tip #233, using frosting to make the furry hair of the monster. Start at the bottom, around the cake and work your way up, finishing at the top. Refrigerate while you make the eyeballs. To form the eye balls we used rice krispy bars, formed into walnut sized balls. Cover the eyeballs in rolled out white fondant. Use the blue and green fondant to create and shape eye lids and the iris part of the eyes. Push them onto a sturdy, thick cake pop or lolly pop stick - the thicker ones, not a tiny, skinny stick. You would also use chop sticks. We refrigerated everything at this point and about an hour before the party, used black gel icing to make the pupils. You could also use black fondant and form a little round pupil. Attach the fondant to each other with a bit of water, beaten egg white or a bit of icing. The mini monster cake was made similar, using a regular tip to finish the bottom edge, and store bought little tiny candy balls pressed on wet icing to hold. Here is the little guy getting ready to dig into his own little Monster cake.